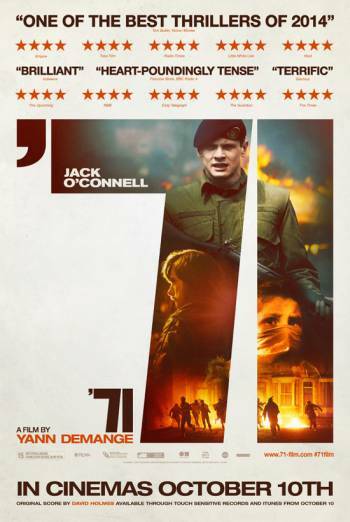 '71 is an action drama that focuses on the experiences of a young British Army recruit in Northern Ireland. There are four uses of very strong language ('c**t'), one of which is used in aggressive frustration. There are more than fifty uses of strong language ('f**k') as well as mild and moderate bad language. There is a scene in which a British soldier is shot through the head with a big gush of blood striking the wall behind him. In another scene, there are close up shots of a bloody gash in a soldier's side being stitched up, and there is sight of the bloodied and armless corpse of a young boy being carried from the flaming wreckage of a pub.